Kikel, Rudy. 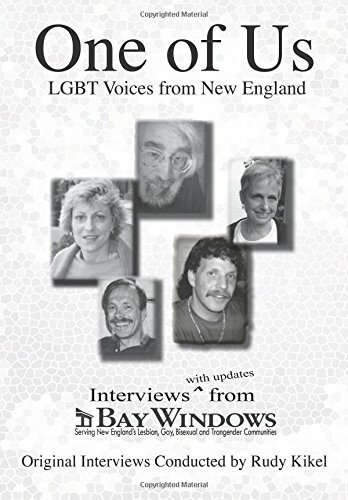 “One of Us: LGBT Voices from New England: Interviews (with updates) from Bay Windows”, CreateSpace Independent Publishing Platform, 2014. Even though I am fairly new to Boston and New England, I quickly discovered “Bay Windows, the LGBT newspaper that comes out every Thursday. Unfortunately there is not a great to read it but I did go back and look at past issues and found Rudy Kikel’s column about the members of the LGBT community. Kikel was the Arts and Entertainment editor of “Bay Windows” when it was a viable news magazine. There days you have to wade through a multitude of ads to find something to red and I, frankly, am surprised that the paper has stayed afloat. Most of the people I know do not bother with it all and then there are those who faithfully read Billy Masters’ gossip column that is little more than Master patting himself on the back for… whatever. But I am not here to write about the paper. In reading Kikel’s book, I learned that for over ten years, Kikel invited members of the LGBT community into his home and as they came he “sat them in a red chair in his window, offered a glass of water, and pulled from a standard menu of questions for an hour or two”. He was limited in questions but he got unlimited answers. What he saw was that he was getting information from a microcosm of the LGBT community and the larger straight community as well. As they talked, Kikel would type and then take a photo and a week later the interview would be published in “Bay Windows”. This book is a compilation of about 40 of those interviews. We also get an update from each interviewee on where he/she is. The interviews give us a look at LGBT history as the twentieth century turned into the twenty-first century. The book is a simply written and we get a look at the Boston community from those in it and it serves as a documentation of times past. It is almost as if Kikel has given us our memories back and a souvenir of a time before the new technology when people actually met with each other for interviews. This entry was posted in GLBT non-fiction on December 1, 2014 by Amos.